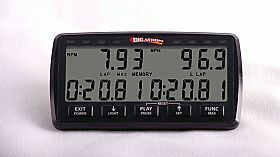 Rugged and dependable Digatron's performance gauge systems offer advantages for both the racer and recreational user. Use these systems to simply monitor your engine and obtain your maximum readings or utilize their full capacity by relaying engine information on the instrument.Whether you are looking for peak engine performance, or a system to monitor engine modifications the 64LT series instruments can accomplish this! Large easy-to-read display makes this instrument the ideal tool for monitoring and tuning your vehicle. Red LED lights serve as an ideal engine warning system. This instrument has thermocouple temperature functions. Either a CHT, EGT or Water Temperature sensor can be connected to a temperature function on the gauge. The limit entered in the instrument will determine if the instrument displays CHT or EGT. We offer a large variety of instruments, accessories and options. We encourage you to call us with any questions regarding our products.